The media is buzzing these days with stories about bitcoin, the most popular of available crypto currencies. First proposed in 2008 and implemented in 2009, recent bubbles and crashes in the exchange-rate for the bitcoin have everyone talking about it. And while the volatility and investment possibilities of bitcoin are intriguing, to me the truly interesting aspect is the role of the bitcoin miner. As the name implies, bitcoin miners – which are generally either computers or specialized hardware – are responsible for mining new bitcoins. However, that is not their primary function. Those individuals running bitcoin mining software are, in effect, running the bitcoin transaction processing network in a peer-to-peer fashion. You can think of this as another distributed computing system like SETI@home and Folding@home. By using your computer hardware’s spare cycles you can contribute to a growing, global, distributed crypto currency. If that’s your thing. And you can actually come out ahead financially. Now, arguably, this won’t last much longer. There is specialized hardware on the horizon that may make it much less profitable to mine bitcoins. But, for the time being, if you already have a Radeon 5x series or higher GPU then there’s a decent chance you could do this and make a couple of dollars a day (US, not bitcoin). Check out this hardware chart and this calculator for more information. As it happens the most recent Mac Pros ship with Radeon 5x series GPU’s and can use 6x series Radeons with OS X Lion. However, most of the bitcoin mining software is aimed at Windows and Linux. There really aren’t a lot of options available for mining bitcoins on OS X without a little extra effort. BitMinter is a great service for trying out bitcoin mining with minimal effort. BitMinter functions as a bitcoin pool and as mining software. Their mining software is a Java app. 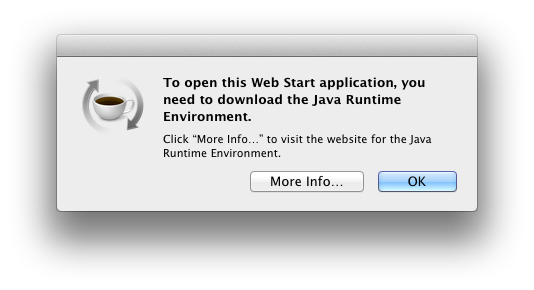 While Java can be a good choice for providing a single app for multiple platforms, recent changes in the Java runtime environment on OS X mean that the BitMinter app may not run without some work. 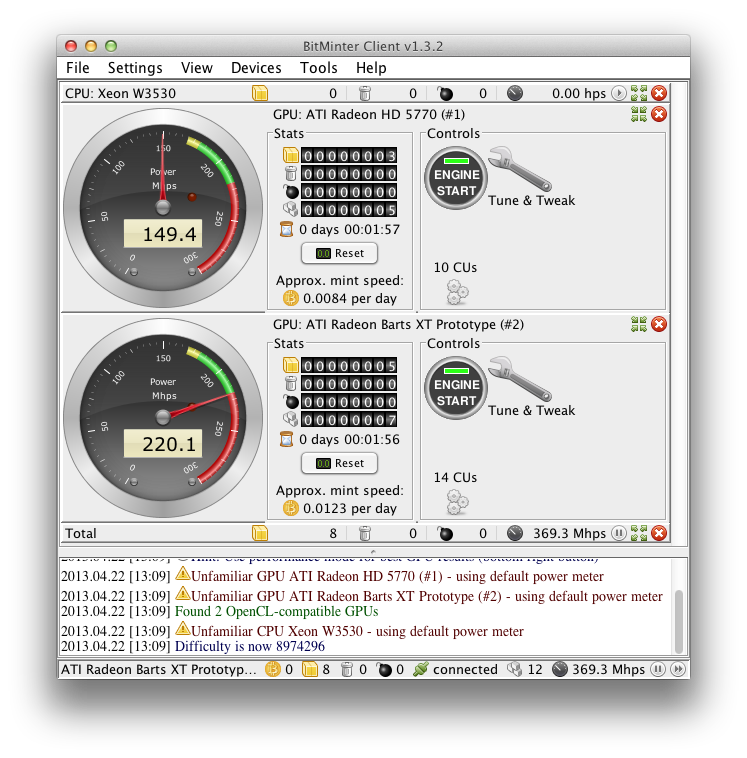 Once the BitMinter app fires up, you’ll see collapsable panes for each CPU and GPU. It is absolutely not worth mining bitcoins on your CPU at this point (though you could look into Litecoins to put your CPU to work). To start mining, click the Engine Start button for each of your GPU’s. So far I’ve glossed over the idea of mining “pools”. While this is outside the scope of this article, know that you will need to pick a pool to participate in. Mining pools are collections of individuals mining common blocks of bitcoin transactions. This means you get paid small fractions every couple of hours instead of waiting months or even years for larger, rounder payouts. They have different payout methods and percentages, but BitMinter is a very good one with low fees (1% currently). You can read more about the available bitcoin pools here. If you’ve tried out mining with BitMinter and it seems interesting to you, watch for future articles on using GUIMiner, cgminer and bfgminer on OS X. These utilities remove the Java requirement and offer performance improvements while also letting you participate in the pool of your choice. This entry was posted in CryptoCurrency, Technology on April 22, 2013 by Nathanial Woolls (Nate). Java vs. C (“native”): both Java and C will be compiled into native machine code (just-in-time compilation in Java’s case). But neither impact mining speed at all, since the GPU code is written in OpenCL, not Java or C. The hashrate is influenced by different OpenCL kernels (programs) that different miner software use and by your GPU driver version and your GPU model/architecture, so you may want to try different combinations if you want to hunt for the very best hashrate. For some, BitMinter client is the fastest. Thanks for the clarification. I wasn’t trying to imply that the performance difference was due to Java versus Native, though maybe my wording was poor. I was simply using those terms to differentiate between the various miners. From my mining days, I don’t remember BitMinter being much slower or faster than the other clients. The only thing that differentiated them was over-clocking and minor tweaks. Overclocking led to so much instability that the downtime greatly outweighed the loss in raw speed. I love your articles, they got me dabbling in it pretty hard now. I’d love a post about how to get cgminer running on a Mac OSx for those of us who don’t use the command line ever. Thanks for the info, very helpful! Hi Matt – thanks for the kind words and feedback. I’ve posted an article here that details how to get cgminer running on OS X. Understanding you don’t use the command line, can you let me know what steps are missing? Using Terminal.app is unfortunately necessary here, but I am hoping the article makes it as easy as possible. Hi, I’m trying to use an ASIC Bitcoin miner, but Bitminter does not seem to be recognizing it when i probe all the Ports. Do you know why this may happen. I’ve tried re-starting and every time it doesn’t detect anything, even though the Miner’s light is on and its increasing in Temp. Make sure the driver is loaded. bitminter needs a driver for the asic miner, cgminer does not. in fact the driver will prevent cgminer from seeing them.